Barrack Obama made many promises during his election campaign. He swept the willing masses along with promises of Hope and Change. He explained how he was a constitutionalist and respected the founders views. He said that he didn’t believe that the Presidency should be accumulating more power outside it’s remit and suggested that the Bush Administration had done this. Before election he espoused the rule of law and liberty and freedom and the Constitution and Bill of Rights. Now he wants Military Tribunals and to imprison people for ten years for crimes they have not committed YET ! And his final promise . . . . Does this littany of deception finally convince the rest of the die hard Democrat voters that they have been duped in exactly the same way that the Republican voters were duped into voting for Bush? OK this is very funny but it has a very serious message. Diebold and 3 other private companies make and run the electronic voting machines that count 80% of the votes in the US elections. There seems to be a lack of trust in the system. Bev has since been blackballed by all the mainstream networks. WHY? Because the main networks are controlled by the same people who want to rig the elections. You really should watch the movie here for free and it is very interesting and you will be shocked ! We all remember the US Presidential election of 2000 when Al Gore got more votes than George W Bush but still lost the election. We all remember how George’s brother Geb as Governor of Florida engineered the result that swung it Georgie’s way by refusing the recount. Well that was the start of sophisticated election fraud. Just take a look at this clip and listen carefully to who and where the man testifying says he wrote a computer programe to rig the vote. The same thing happened 4 years later in Ohio, the swing state that would have won it for Carey which polls had suggested he would take. The demanded recount was also hijuacked by the election staff by giving a 3% “random” sample of votes to be recounted that was tampered with to match the computerised results so a full recount could not be claimed. However no historical recount can be done either because against Federal regulations approximately 2/3 of the ballot boxes were destroyed instead of being archived. People have been jailed for this fraud by the way but it didn’t change the result. Now for the next election the Vote fraud is going to get worse. The video above showed just how easy it is to rig the computerised vote and believe me it is already happenning even in the Primaries. 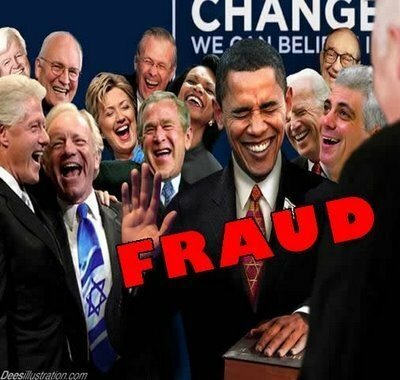 There is war going on at the moment about the discrepancies of the Ron Paul and Obama votes in the New Hampshire Primary which against the polls, was won by John McCain and Billary Clinton. Here is a series of videos made which highlight what has happened already. Undoubtedly the same techniques were fine tuned in 2004, and will be perfected in 2008. The next clip really damns the people running the election but you need to stay till the end to see properly. All of the candidates who were the final runners in the Primaries (McCain, Romney, Giuliani, Obama, Clinton, Edwards) are member of the CFR (Council on Foreign Relations) along with people of the calibre of Bush, Cheney and the rest of their cronies, as well as the leaders of the mainstream media, the Bankers, the Federal Reserve owners, the main industrialists, Insurance companies and finance houses. So whoever you vote for Democrat or Republican is taking you to the same destination. The goals of the CFR, the shadow government of the USA. I won’t post anymore info on this as it is a blog in itself along with the Federal Reserve and the attempted coup earlier last century but you may want to look into who they are and what their goals are yourselves. They are all the same, the election is really a sham anyway. We were threatened with these electronic voting machines in Ireland a few years ago and our opposition parties would not allow it, they know full well how corrupt our ruling party is so they would not take us down that road.